Do you want to be the very best, like no one ever was? If so, then you’re probably one of the 7.5 million people who have downloaded the Pokemon Go app since its recent launch. The app, a location-based augmented reality game that enables you to catch virtual Pokemon in the real world, has experienced a tremendous start since its release in the United States. Pokemon Go has captivated mobile users of all ages worldwide, quickly becoming a cultural phenomenon. Within weeks, the game generated an estimated $1.6 million in revenue per day. Benefiting from this instant success is Nintendo, parent to Pokemon Co., which has already seen a 25 percent increase in stock shares and added nearly $11 billion to its market value. The popularity of Pokemon Go and its clear potential for profit not only have opened the door for Nintendo’s success, but also have become a tool for Pokemon-inspired marketing by food and retail businesses. The game format encourages users to explore their real-world cities to find in-game Pokemon , PokeStops or Gyms, which can be found at actual landmarks and local businesses. This alone is a valuable marketing tool that can result in rising visits and an increase in foot traffic for any organization hoping to convert locals who want to play into customers willing to pay. Some establishments have already realized the marketing potential of the virtual Pokemon in the real world. By flaunting ties with the game, Main Street businesses have been able to set themselves up for an increase in recognition, popularity or profit. Storefronts have found a number of ways to engage with the traveling hordes of Pokemon trainers. One of the most popular methods of capitalizing on the app’s hype is to place Lure Modules at Poketops at or near a business’ location. A Lure Module is a well-recognized in-game feature that enables users to attract Pokemon to a certain area. Although the Lure Modules were designed to bring in Pokemon, they’re also bringing in a slew of gamers. Pokemon Go has become a great way for retail business to attract potential customers to its location. Once gamers are lured in, stores have taken “Poke-marketing” a step further by offering tailored discounts and promotions. These strategies are just the start of what is sure to become a more prevalent marketing approach as the app rolls out in more countries, evolves and inspires copycats. Bringing an entire generation’s childhood nostalgia into the modern age of augmented reality gaming is unlike anything we’ve ever seen before. Although this level of popularity can be fleeting, Pokemon has retained its status as a recognizable and well-loved brand since 1996. With the game’s technological sophistication and promise of added, advanced features—in-game chat functions, head-to-head battles, Pokemon trading, and so on—there doesn’t seem to be an end to Pokemon Go’s success anytime soon. Though every workplace has its share of characters, they might not be as recognizable as those atPBS. For one thing, you’ll never find an accounting department quite as enthusiastic about numbers. Sure, some co-workers can seem cliquey, and others are downright grouchy. But even the brutish exterior of the office monster quickly crumbles. If anything, most staffers are probably too friendly(that’s HR’s problem, though). Meanwhile, the characters on the PBS KIDS public relations and social media team are experienced in both fields, a professional precedent its newest associate director will need to uphold. Supporting the network’s PBS LearningMedia initiatives, this person will work with its corporate communications team on projects ranging from managing media contacts and developing editorial calendars to assisting with PR and crisis communication efforts. Click here to read the full job description, and then find out even more about the characters working at PBS. Director of casino marketing—Carnival Corp.
Alan Pearcy. Alan doesn’t like when people refer to themselves in third-person, so he will henceforth, stop it, now. Born and raised in Springfield, Ill., I’ve had my fill of all-things Abe Lincoln. Inching upstate on the map little by little, I attended Bradley University in Peoria, where I graduated in 2008 with a B.A. in communications and advertising. I kept moving on up until I reached sweet home Chicago a couple years ago. After a stint at Leo Burnett in the Windy City, I freelanced as a writer and advertising pro of sorts, along with a few other odd-jobs, until joining forces as an editorial assistant with Ragan Communications. Things you should note: I am a Gemini, I am blonde, single, I bruise like a peach, I have webbed-toes, I will stop at nothing to wear flip-flops, and that aside from writing, I sustain sickly obsessions with popular culture, exercise, coffee, and amazingly poor choice in both film and TV. I also fall a lot. If you have a job you would like to see highlighted on PR Daily, please email me or send me a message on Twitter @iquotesometimes. Visit PRDaily where this excerpt originally appeared. Successful public relations hinges on the ethics of its practitioners. Like journalists, PR practitioners often face challenging ethical issues that are best solved by adhering to the industry’s code of ethics. The biggest difference between public relations and journalism’s adopted ethics codes are the people each code serves. While journalists serve the public and its right to know, PR professionals primarily answer to their clients and companies. 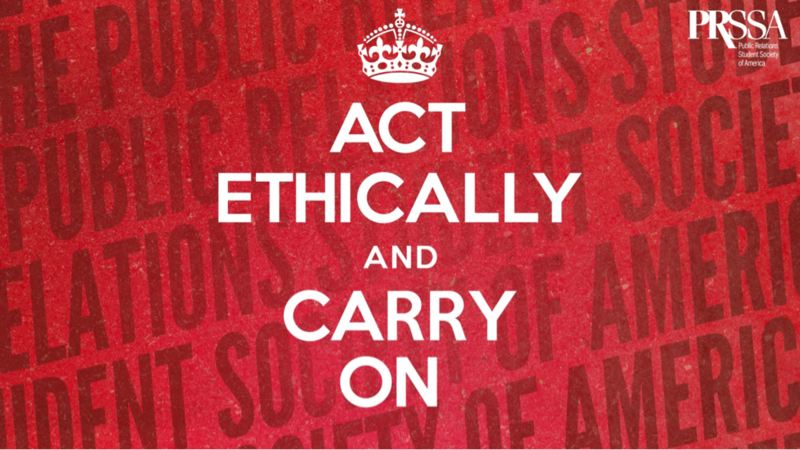 PRSA’s ethical guidelines are perhaps the industry’s most widely recognized code for ethics. They cover the necessity for honesty, accuracy, integrity and confidentiality. The Professional Standards Advisories (PSAs), designed to keep the PRSA code timely, address PR-specific areas and modern practices, including recording conversations, use of interns, video news releases, pay-for-play journalism and disclosure guidelines. Both codes are quite comprehensive and benefit PR agencies and companies when followed. But are they comprehensive enough? Perhaps it’s time for PR to adopt some of journalism’s ethical guidelines. PR inherently serves the public (it’s in the name), and PR practitioners are functioning more as journalists; more PR content is now reaching the public directly without review and editing by the press or other independent journalists. With this in mind, we’ve examined some principles from The Society of Professional Journalists’ Code of Ethics, not (yet) covered in PRSA’s code, that may be worth adopting by PR. To follow their promise of being “fair and balanced,” reporters must always get all sides of the story. This is why you’ll often see statements like, “Mr. so-and-so did not answer calls for comment.” The mention is proof that the reporter attempted to get the other side’s point of view. Even recognizing that PR is an advocacy profession, the inclusion of some balance would likely enhance the credibility of PR-produced communications materials. That balance is especially important in the appropriate use and interpretation of facts and statistical data. Suitable balance can be achieved by including the viewpoints of independent experts. Adding the layer of credibility can gain trust of PR practitioners and the businesses they represent from both journalists and consumers. Make certain that headlines and content do not misrepresent. They should not oversimplify or take incidents out of context. Public relations specialists should never choose a witty or mysterious headline over one that tells the truth. Make it a principle never to mislead your audience, especially on social media when creating clever messages to attract more attention. Out-of-context messages can also backfire, as The Colbert Report’s PR team recently learned through this social media post. Avoid misleading reenactments or staged news events. If reenactment is necessary, label it. This guideline pertains mostly to photographs and videos used in news articles. Staged photographs have gotten journalists fired because they don’t accurately represent the scene. When you stage a product demonstration, the demo must accurately and precisely portray the capabilities of the product or service as it exists at that time – not as you expect or hope it will exist in the future. Up until 2011, the White House would often reenact speeches and photo-ops for the press. For example, when President Barack Obama finished his on-air address about the death of Osama bin Laden, he then re-enacted his walkout and the first 30 seconds of the statement for the press. The White House has since stopped its practice of staging photos, but until that point, the public could not be sure whether footage of the president’s speeches was real or fake. Never distort the content of news photos or videos. Similar to the guideline above, PR should take all steps necessary to be honest with their audience. When using photographs, it is inappropriate to distort them through editing. Stereotyping is not always deliberate, but can sometimes show up in PR materials. Prohibit it and always look out for it. Stifling dissent and criticism, once a standard responsibility of PR, is no longer an effective PR tactic given the all-permeating presence of social media. Recognize that the process of gathering and reporting news may cause harm or discomfort. Pursuit of the news and defense of published materials does not give license for rudeness or arrogance. Refuse gifts, favors, fees, free travel and special treatment. Be wary of sources offering information for favors or money. Avoid bidding for news. Accept, work with and even encourage the public’s ability to voice grievances against the news media (or in this case, your company or PR agency). Bottom line: PR is best served by adhering to both PR and journalism ethics. Some journalism guidelines are not entirely appropriate for the PR industry, but may provide guidance on behavior not addressed in PRSA’s code of ethics. Which journalism guideline(s) do you think PR should follow? Share in the comments below. William J. Comcowich is the editor of Media Monitoring News and the CyberAlert Blog, where a version of the story originally appeared. He is also founder, president and CEO of CyberAlert, Inc.
A few weeks ago, I sat down with the managing director of Ogilvy Atlanta, Mickey Nall, for lunch, and my life goals changed. The day began with his talk at The John Koten Distinguished Lecture Series, hosted annually at The University of Alabama by The Plank Center for Leadership in Public Relations. Afterward, UA’s public relations student leaders were invited to a lunch with the man of the hour. Nall is a firm and straightforward speaker, filled with love for his field and high expectations for future leaders. His sound bites could scare a lion, but the passion behind his every word offers hope for potential colleagues. He is a leader I hope to grow to be one day. Nall spoke about leadership, storytelling, and passion. He enticed us with stories of his path to Ogilvy and his time at the firm. He gave just a glimpse of the life we all are about to venture into, and we were allowed to ask as many questions as we wanted. Below, I’ve listed some of the key points he made. Some of his advice may scare you, but odds are you’ll want to handwrite him a thank-you note later. 1. If you want a job, stand out. Did I just scare you with the “three internships” comment? Don’t worry. Nall considers serious organization involvement as an internship. 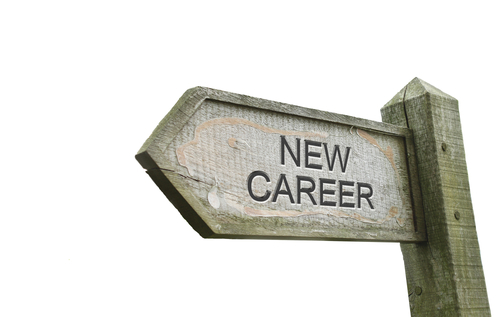 PRSSA, PRCA, and even getting into PRSA after college will increase your chances of employment. 3. Make your résumé pop. Obviously, experience should be highlighted, but the only résumés that will get in front of Nall are those without error, show true skill, and are specific to the job and firm. “You should make a résumé for every new job for which you apply,” Nall said. Point blank, if it is obvious your résumé is generic and used for every application, no one hiring will want it. Side note: Nall said color should be minor and keywords of the company’s values should be major on your résumé. You should love public relations and all that you can do with it. Nall gave the example that he would rather hire a gamer with passion in his or her eyes than a public relations major who just wanted to avoid math. 5. Use that wiggle room. Know what companies you admire and set your goals through that. Take these opportunities on, and you will be ahead of the game. 7. The interview is not all about you. If this article doesn’t make you want to work harder than you ever knew possible, I’m not sure what will. Speaking with Nall was a joy, and I imagine working with him would be even better. Students, print this list and keep it with you. Then go the extra step. Don’t let anything be an excuse that stands in the way of success. Myreete Wolford is a senior at The University of Alabama studying public relations and communications. She is also an editor for Platform Magazine, the school’s student-run public relations publication. Visit Ragan’s PR Daily where this excerpt is originally appeared. You probably used LinkedIn at least once today to do some research (as opposed to spying) on a client or potential client, colleague within your own company, potential hire or potential new employer, or a journalist who covers your industry. So you use LinkedIn, but that doesn’t mean you really know how to use it. If you ask Lori Russo, managing director, Mid-Atlantic, for Stanton Communications, which of the leading social networks is least understood by PR pros, she’ll give you her answer before you even finish asking the question. For communications professionals responsible for growing their business and positioning their clients for growth, LinkedIn is potentially the most valuable tool in the digital arsenal. Not only does it connect organizations and individuals with peers and potential partners, it offers new opportunities to build relationships with journalists who use the site to research companies and identify sources. Russo sees four common mistakes that PR pros habitually make on LinkedIn. How many of these are you guilty of? 1. Incomplete Profiles. LinkedIn offers an opportunity to share with the world a multimedia rich version of your professional life and experience. The platform enables you to be extensive and thorough about your experience, your capabilities and your point of view on industry issues and offers options for adding links and uploading files, including PowerPoint presentations through LinkedIn’s SlideShare integration. These files can include everything from sample campaigns to powerful media placements. Adding these enhancements and incorporating relevant keywords will make your profile more “findable” for prospects, potential employers and journalists seeking a specific kind of expertise. For agency pros, it is a good idea to offer to help clients who are subject matter experts or spokespersons build out their profiles as well. 2. Weak Contacts. LinkedIn provides a great avenue to solidify existing business relationships and build new ones. Take a moment to connect with your colleagues, your client contacts and prospects you know well. When it comes to reporters, those with whom you have an established relationship will be more than happy to connect on LinkedIn. Consider proactively inviting them to connect and use the opportunity to ask for introductions to their colleagues you would like to know. If you are using LinkedIn to connect with anyone you have not yet worked with but would like to know, be sure to include a personal note explaining why you, and possibly your clients, are relevant. 3. Inconsistent Updates. It’s funny how PR pros can find the time—several times an hour or a day—to share irrelevant posts on Twitter and Facebook, yet their LinkedIn updates are few and far between. LinkedIn users who share updates at least once a week are 10 times more likely to be approached for new opportunities. These may include new clients, partners, employers, recruits or reporters looking for sources. By keeping your feed current with company and client news, articles in which you are quoted as a subject matter expert, corporate blog posts or your perspective on industry issues, you will maintain a position that is front and center on the LinkedIn news feeds of your contacts and remind reporters that you are a potential resource. 4. Outdated Company Pages. LinkedIn aims to be the primary engine for business-related searches. More and more business leaders and journalists are using the platform to find information about individuals and organizations. To ensure the information they find is fresh, accurate and relevant, consider LinkedIn a key piece of your company’s (or clients’ companies) content marketing plan. Offer to work with the company page manager, provide content for updates, develop creative for the header image and create Showcase Pages for prominent products and services. By providing a wealth of information in one place, you are building your organization’s newsroom on a site reporters and others are already using for research. Written by Steve Goldstein. Follow Steve Goldstein: @SGoldsteinAI. Visit PRNews where this excerpt is originally appeared. Want to learn more about giving your a PR career a boost with LinkedIn? Register now for PR News’ June 3 Social Media Summit in New York. How Do You Tie Your Content Back to Your Vision? I’ve just sat through two-days of speakers at Content Marketing World in Sydney. On the whole, it was a good conference – interesting. I love listening to smart people. Almost as interesting as the content the speakers delivered however, was the attendees’ reaction to them as individuals. People like Joe Pulizzi, Robert Rose, and Mark Schaefer have celeb status when it comes to the world of Marketing. And not without reason. They have personal brands as big as some companies. Why? Their content ties back to their visions. You’ll know from my two previous Linkedin Influencer Posts, here and here, I believe this is a critical part of getting content right. 1. Vision has to be based on values. Values are a way to show how much you care. They have to align with your vision, or else it means nothing. Redhill said, “People don’t care how much you know until they know how much you care.” Values, as communicated through content, make the difference between it being a memory quickly forgotten, and it changing an understanding or behaviour. Consequently, all content should have a simple values test before you publish it. 2. Content must stand for something. It’s not the number of words on a screen, the time a video will play for, or even how many people looked at it. If that’s true and content has greater meaning than these measures, does it make sense to own or lease the platform for its housing and dissemination? I don’t buy into the hype around ‘brand journalism’, but brand publishing is here, and it’s only going to get bigger. As such, social platforms should support your content, but its spine needs to be on a platform you own. You need to invest in the tools and people to get this right. After all, it’s your vision – not someone else’s. Don’t leave yourself in a position where someone else could pull the rug out from underneath you at a moment’s notice. 3. Like a courtship, you have to be passionate about your content! This can seem like a challenge. After all, not all businesses create inspiring or exciting products or services. The gurus at the conference are in an enviable situation (at least from where I sit as someone who shares their passion for good content). But… that’s why vision is so important in your content and storytelling. It’s not about your products and services as such, it’s about where you are going and why. It’s about your people and the way you are positively impacting your environment. And that’s a vision worthy of good content! Written by Aaron Crowther. Aaron is the founder of ASCommunications and Group Business Director for MaxAustralia. You can follow Aaron on Twitter @ASCommsTweeter or via his blog Commspro.me. Visit businessesgrow where this excerpt is originally appeared. As best as I can piece the data together, the three largest news release distribution services (PR Newswire, BusinessWire and Marketwire) sent out roughly 642,000 news releases in 2013. If you’re keeping score, that’s about 1,759 news releases per day. Too much of a good thing becomes a bad thing. You can quote me on that. Put a half gallon of rocky road ice cream in front of Fat Albert, and even he’ll turn away before he hits bottom. Exacerbating this dynamic, the ranks of journalists continue to decline. 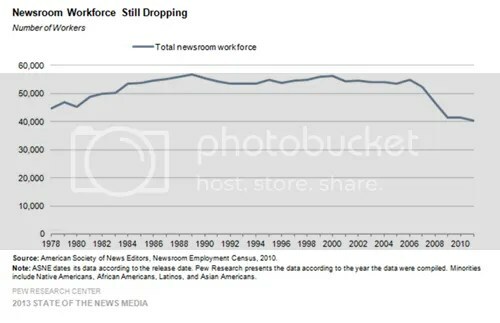 The number of reporters toiling in newsrooms is actually less today than in 1978 according to the Pew Research Center. The upshot – more news releases raining down on fewer journalists. But explaining the commoditization of the news release as a form of supply-demand economics misses the root cause. When distribution of the news release reached only the domain of the media, journalists enjoyed a free lunch. With little effort, they could write stories based on a news release, and those stories appeared fresh to their readers because they couldn’t find them elsewhere. This advantage disappeared around 1996 when news release distribution services started flinging out news releases to the masses via the Internet. 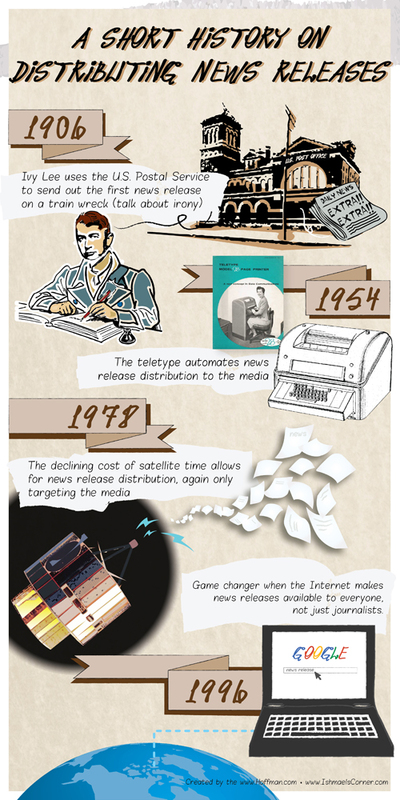 Stepping back in time for a moment, the timeline below offers the 10,000-foot view of how news release distribution has evolved. Journalists had a 90-year run of leveraging the news release as non-public information. When the gravy train ended in 1996, it changed everything, though it took some time to erode the status quo. Muscle memory doesn’t change so easily in the world of journalism. Now, roughly 18 years since earmarking news releases for the public domain, it seems fair to say the commoditization of the news release is complete. Given that journalists rarely write from news releases these days, why does the massive effort behind news releases – figure around 10 man hours per news release at $175 per hour translating into $3,078,082 of cost last year – continue? Disclosure requirements explain only a small percent of the total pool. Plus, I’m sure this $3,078,082 number doubles or even triples taking into the account the news releases not earmarked for paid distribution. 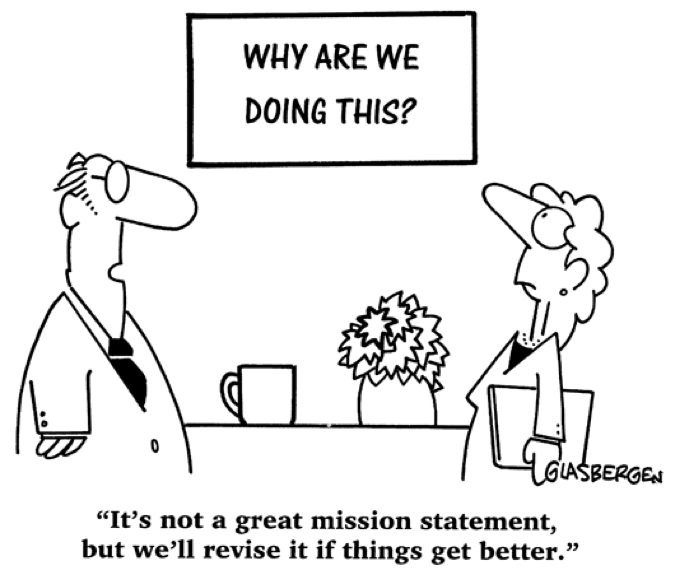 Perhaps the PR industry has its own challenge with muscle memory. Update: I rejoiced when I completed geometry in high school and my math education came to an end. So I wasn’t completely surprised when Chris Hogg pointed out that my math went astray in calculating how much money goes into the production of a news release. The correct number is $3,078,082 per day, not year. Written by Lou Hoffman. He is CEO of the Hoffman Agency a global communications consultancy. He blogs on storytelling in business at Ishmael’s Corner, where a version of this article originally appeared.